Embark on a journey of discovery as you start in northern India’s ‘Golden Triangle’ area. You’ll take in the cities of Delhi, Jaipur and Agra each with its own distinct character. Explore New and Old Delhi and contrast their distinct personalities, visit Jaipur’s impressive Amber Fort and Jantar Mantar Observatory, and see the iconic Taj Mahal in Agra. From there you’ll head south for Kerala on India’s south west coast. Lush and beautiful, this is a land of green hills and tea planataions. Explore the port city of Cochin before heading for Alleppey from where you explore the beautiful backwaters of Kerala aboard a houseboat – the perfect conclusion to a memorable holiday. Depart on your overnight flight to Delhi. Transfer to the locally rated 5-star Crowne Plaza Mayur Vihar New Delhi for a two-night stay with dinner and a welcome briefing this evening. Discover Delhi – a city of two parts. In bustling Old Delhi explore the famous Chandni Chowk Old Delhi Market, teeming with people and vendors selling everything from food and spices to textiles. You’ll also see the 17th-century mosque of Jama Masjid – the largest in India, and drive past the Red Fort, once the residence of Mughal emperors. In New Delhi, visit Raj Ghat where Mahatma Gandhi was cremated, as well as the 12th-century Qutub Minar minaret and stately Mausoleum of Humanyu, a UNESCO World Heritage Site, a drive past the India Gate war memorial and Rashtrapati Bhavan (Presidential Palace). Relax this evening or perhaps join an optional excursion to a Gungroo – a dinner and dance theatre. Drive to Jaipur (which may take in excess of six hours, depending on the traffic). Check into the locally rated 5-star Hilton Jaipur for a two-night stay. Perhaps join an optional evening visit to the Choti Choper Bazaar – perfect for hunting out some souvenirs. Enjoy a full day of sightseeing including a visit to the Amber Fort via jeep and discover this beautiful complex, built from white and red marble and made up of a series of palaces, courtyards, temples and gardens. There will be a photo stop at the Hawa Mahal (‘Palace of the Winds’) with its 953 windows, plus visits to the Maharaja’s City Palace – still partly used by Jaipur’s Royal family, and the 18th-century Jantar Mantar Observatory, a UNESCO World Heritage Site, home to around 20 fixed astronomical instruments – some the largest of their type ever constructed. This evening parhaps join an optional visit to an Aarti ceremony at the Birla Temple. Travel south to Ranthambore, via the city of Sawai Madhopur. En route, visit the 9th-century Chand Baori Stepwell with its maze-like appearance, elegant symmetry and architecture. Built to collect and store water with countless staircases rising through its 13 storeys, discover this little-known and fascinating archaeological site before continuing to Ranthambore where you will stay close to the National Park at the locally-rated 5-star Jungle Villas. Visit Ranthambore National Park, the largest wildlife reserve in Northern India and Rajasthan’s first tiger reserve. During the day you’ll join a morning and an afternoon Canter (open-sided safari bus) safaris. The park is home to sambar deer, a wealth of birds, crocodiles and, of course, the majestic tiger. Watch for these elusive and beautiful big cats during your park safaris, although sightings cannot be guaranteed. Early this morning travel by train from Sawai Madhopur tor Bharatpur, from where you’ll continue by road to Agra. On arrival look forward to an afternoon tour of the city, visiting the I’timad-ud-Daulah (the ‘Baby Taj’). This beautiful 17th century building with its inlaid marble decoration is sometimes regarded as the forerunner of the Taj Mahal. Relax at the locally rated 5-star Courtyard by marriott in Agra where you will stay for two nights, or join an optional evening show based on the story of the Emperor Shah Jahan and his wife. The Taj Mahal in Agra is celebrated for its architectural magnificence and beauty. Built by Shah Jahan in 1560 in memory of his wife Mumtaz, it took 22 years and over 20,000 craftsmen to complete. Join an excursion to see this fabulous building at sunrise. Later, visit the nearby 16th-century Agra Fort. This UNESCO World Heritage Site with its palaces and mosques enclosed by red sandstone walls was once the home of Mughal Emperors. Later today drive to Delhi where you will return to stay overnight at the locally rated 4-star Novotel New Delhi. Transfer to Cochin where you stay at the locally rated 4-star Crowne Plaza Cochi novernight. After arrival, see some of the highlights of Cochin city on a tour taking in St Francis Church and the Basilica of Santa Cruz, as well as Fort Kochi, the Dutch Palace and the extraordinary Chinese fishing nets that dot the northeastern shore of Fort Kochi. Drive east to Munnar, set within India’s largest tea-growing area. Beyond the town lie green rolling hills and captivating landscapes dotted with tea estates and plantations. Upon arrival transfer to the locally rated 5-star Fragrant Nature Munnar for a two-night stay. 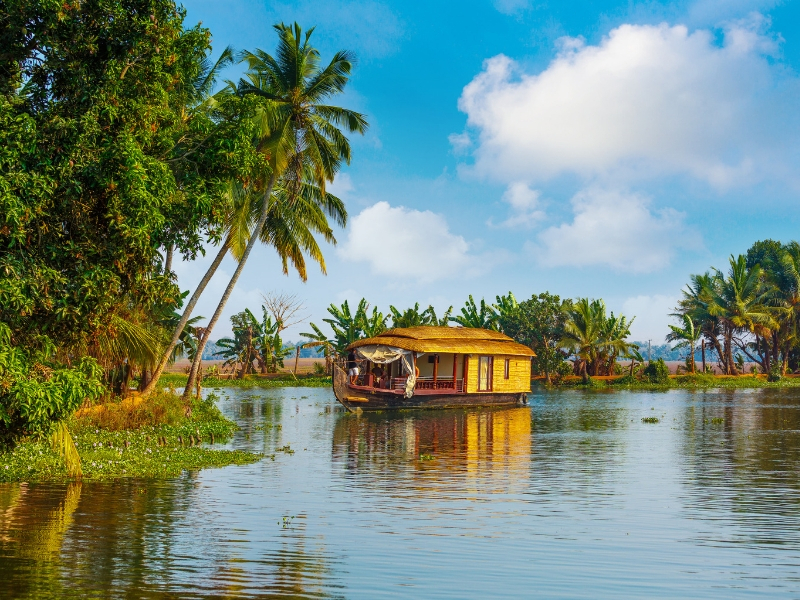 Head to Alleppey, the gateway to Kerala’s lagoons, and step aboard a Spice Routes Houseboat for an overnight cruise through the Kerala backwaters, regarded as the ‘Venice of the East’. Disembark and transfer to Cochin, where you stay overnight at the locally rated 4-star Crowne Plaza Cochin, enjoying a farewell dinner this evening. THs waterfron hotel has three restaurants, a coffee shop, two outdoor pools, a spa, health club and free Wi-Fi in public areas. All 269 rooms have free Wi-Fi, an iPod docking station, LED television with cable channels and a minibar. Perhaps join an optional excursion to see a Kathakali dance performance. Travel to the airport for your flight to the UK.